Mobius camera anti-vibration mount version 2 by PersonalDrones is licensed under the Creative Commons - Attribution - Share Alike license. The main improvements with respect to the previous version are that the design is more precise, thanks to my design skills getting better, and a couple of holes for a zip tie or rapstrap were added in a position that will leave the 3 buttons of the camera entirely accessible. 4 holes are positioned so as to allow mount to a DJIF450, in one of the protruding extensions of the lower frame plate of the quad. Lateral grooves allow for a quick way to tie the mount to a multirotor with a battery velcro strap. 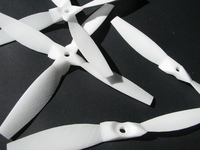 Say thanks by giving PersonalDrones a tip and help them continue to share amazing Things with the Thingiverse community.